1.The crisis has deep national, social and psychological roots. Our island contains two consciousnesses or two types of consciousness, two competing states of mind. Contrary to myth, the periphery of our island has the longest uninterrupted colonial history in the world; 450 years, from 1505 to 1948. This has resulted in a residue, sedimentation in the consciousness. There are elites, classes, strata, who have a dependent, colonial, pro-imperialist, puppet, parasitic existence and mentality. Not all the classes that live in the island’s urban periphery have such a consciousness, but there are handfuls that do, together with their supportive petty bourgeois and lumpen strata. This was the Lipton Circus crowd. In the political lexicon these are known as comprador or intermediary classes, elites; intermediaries between imperialism and the nation. The UNP’s current leadership and its supporting civil society represent this comprador consciousness. This has not always been the case with the UNP, and one of the island’s least comprador and most patriotic leaders, Premadasa, was also the leader of the UNP—but he was an exception, not the norm, just as Chandrika Kumaratunga was an exception to the collective consciousness of the nationalist SLFP; not the norm. President Sirisena seemed to be a successor to her but he was not and has now returned to the SLFP’s nationalist norm. 2.The crisis then stems at least in part from the contradiction between a UNP leadership which is neoliberal globalist even by the UNP’s standards, and a Head of State and government who is a moderate nationalist and populist in his consciousness. This should come as absolutely no surprise because it was precisely his nationalist-populist profile that made those who reached out to him as candidate in 2005, do so—because it was only such a profile that could cut into the SLFP vote, splitting it between a Rajapaksa vote and a moderate SLFP one. This was the same strategy that was adopted when General Sarath Fonseka was made the candidate. 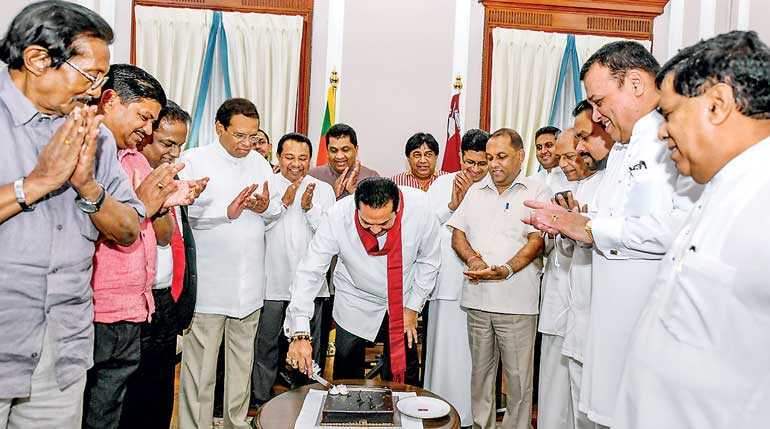 The point was to break the Sinhala Buddhist vote by means of a dissident or defector, because the UNP leadership, unchanged and entrenched as it was, could not do so on its own. The present contradiction between the President and the current UNP leader is but a mild version that would have manifested itself had Gen Fonseka won the presidential race. The inevitability of this contradiction is proved by the sacking of the same Wickremesinghe in 2003 and his defeat at a snap election in 2004, called by the cosmopolitan liberal SLFP leader, President Kumaratunga. 3.It is an untruth that President Sirisena owes Wickremesinghe more than Wickremesinghe owes him. If not for Sirisena, President Rajapaksa would not have been defeated by Ranil (which is why Gen. Fonseka was made candidate in 2010). If not for the defeat of President Rajapaksa, Wickremesinghe would not have made it to the prime ministership. If not for President Sirisena’s intervention in August 2015, Wickremesinghe would not have been PM by means of an election. Had President Sirisena appointed a Special Presidential Commission into the Central Bank bond scam instead of merely a Presidential Commission, and had he intervened to ensure that Dappula de Livera was not prevented from cross-examining the then PM, Wickremesinghe would not even be in legally dubious occupation of Temple Trees. 4.What we are witnessing is not a struggle between democracy and dictatorship. It is a struggle between two models of democracy: Anglo-American liberal democracy and French, Latin American and Russian Presidentialist democracy, with directly elected executive presidencies being the hub and centre of gravity of the system. Russia calls its variant, “sovereign democracy” in which “vertical power” is stronger than in Anglo-American liberal democracy with their emphasis on the separation of powers. 5.This crisis is an existential crisis for the nation. Political systems of nations change and change back, but the nation and its State must go on. A small island nation cannot survive if its ports airports roadways and oil tank farms are given over to foreigners and its provinces given quasi-federal powers. We simply do not have the geopolitical space for that. We have no safe rear. No defence in depth. We are a mere 18 miles from a hostile Tamil Nadu. This is the permanent situation exemplified by the story of the insomniac Prince Dutugemunu who felt acutely hemmed in. Our military’s morale was being targeted by the Geneva resolution. Our people would have been reduced to penury by the neoliberal budgetary policies and the cutbacks, the economic shock therapy that was being administered. Our people would have been reduced to semi-serf status. 6.The crisis takes place in a global setting and the global contestation has local echoes. I don’t like people telling me what to do, or rather, trying to tell me what to do, especially when it is hypocrites responsible for millions of needless deaths who do the telling. The world is dividing into powers that stand for a multipolar world order in which sovereignty is respected and every nation gets to be the best and most that they can in keeping with their choices and distinctive ways, and those others who wish to preserve what they call a liberal world order in which they are the undisputed leader. It is the latter and their allies who try to tell us what to do with and in our own country while they are in a mess in their own (punctuated by mass shootings), and devastate other countries all the while. The first category, those who stand for a multipolar world, do not interfere in our domestic affairs; do not patronise us and are respectful of Sri Lanka’s sovereignty and sense of self-worth. It is our good fortune that foremost among such countries are the world most populous and the world’s largest, China and Russia; one with a powerful economy, the other with a powerful military and outstanding leadership. It is our good fortune that these two countries have an ever closer partnership. It is our good fortune that Russia and China taken together constitute a large Eurasian space. 7.There is a global battle being fought out with the hegemonic power, which is in slow parabolic historical decline like all empires eventually are, tries to contain both Russia and China at the same time—thereby making a huge grand strategic mistake and becoming hugely overstretched. This Eurasian option is on the rise, though the declining empire hopes to use its military and economic power, diminishing as these are in a relative sense, in a desperate gamble to weaken Russia and China. The declining hegemonic power had constructed an Asian sub-system and seeks to keep us locked inside it, so we cannot connect up with our true friend, whose economic power we need, namely China. These hegemons try to keep in place or restore as our rulers, those local stooges who will maintain our island as a base for their effort against China. Thus they interfere in our affairs and even try tactics worked out in places as widely disparate in geography and time as Guatemala and Iran in the 1950s, to Chile in the 1970s and the so-called Colour Revolutions in the 1990s and the disastrous Arab spring of the last decade. This includes the Ukrainian model of forcing an elected President out of power. 8.The bottom line is this: who owns our island? Who will inherit it? Those who care enough for it to fight of its independence, sovereignty, unity, territorial integrity and autonomous way of being, including a way of being in the world? Or the puppets and stooges, the compradors and lackeys of a declining Empire? 9.History shows us that a nation will fight for its existence and its autonomous way of being. Sri Lanka did not cave in despite 30 years of virulent terrorism at the hands of a truly globalised and formidable, suicide-bombing terrorist army. It knew whom and in which direction to turn to in order to survive and prevail. And it did so, all the while keeping its democratic system intact. This time too, in the face of the existential crisis and threat, Sri Lanka will turn among its many choices, to a democratic option that can do the job, breaking through resistance of the puppet elites of the long-colonised coastal cities. 10.What we are seeing now, the realignment of President Sirisena and Prime Minister Rajapaksa, is as good as it gets when it comes to a soft landing; a soft transition from the neoliberal model. If however, it is forced by neoliberal local resistance and external interventionist pressure, Sri Lanka will, in the existential interests of national survival and recovery, adopt the tougher-minded Eurasian political and more importantly, economic model of a populist-nationalist democracy which does not conform to the norms of liberalism still less neo-liberalism, or even shift to a strong centralised state which had yielded magnificent results in Singapore and China. We shall see, no later than this time next year.